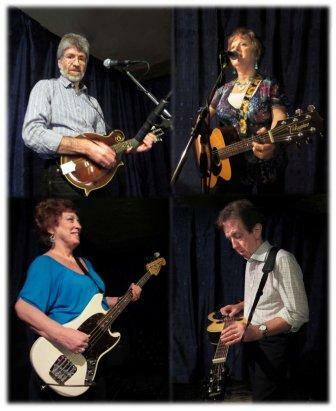 Rich Pickin’s are a family team of musicians from Kent with an enormous wealth of experience. They present refreshing, quality acoustic music from the fields of country, bluegrass, folk and Americana. Rich Pickin’s have distinct and unique sound, with first class vocals and strong harmonies, a range of instrumental sounds and that spark of originality. Not only have the individual members been involved in making music for an average of some forty years each, but they have worked together for over twenty-five years on the Country Music circuit gaining a considerable reputation through their television, radio, theatre, festival and club performances across the country. Lead vocals are provided by Sandie who plays guitar and is widely acclaimed as having one of the very finest female voices in British Country Music. John plays mandolin and also sings lead vocals and together with Ed they produce renowned vocal harmonies. Ed is the multi-instrumentalist of the band playing Dobro and 5-string banjo. Bev completes the line up providing the strong foundation for each song on bass guitar. The band performs a wide range of material from the likes of Alison Krauss, Ricky Skaggs, Dolly Parton, Emmylou Harris, Peter Rowan, The Osborne Brothers, Lou Reid, John Prine and Johnny Cash, to the Dixie Chicks, Eve Selis and Taylor Swift and tucked in there somewhere is some Rolling Stones and Rod Stewart. It’s all presented acoustically with passion, warmth and professionalism to appeal to a broad spectrum of musical tastes.